I have to admit that, other than a quick spritz of hairspray, I’m not one for using styling products on my hair. As it’s super thick, I’ve never been keen on the thought of adding any weight to make it any heavier! Not only that but, because of it’s thickness, any style tends to hold quite well without the need to add any styling sprays or mouses. 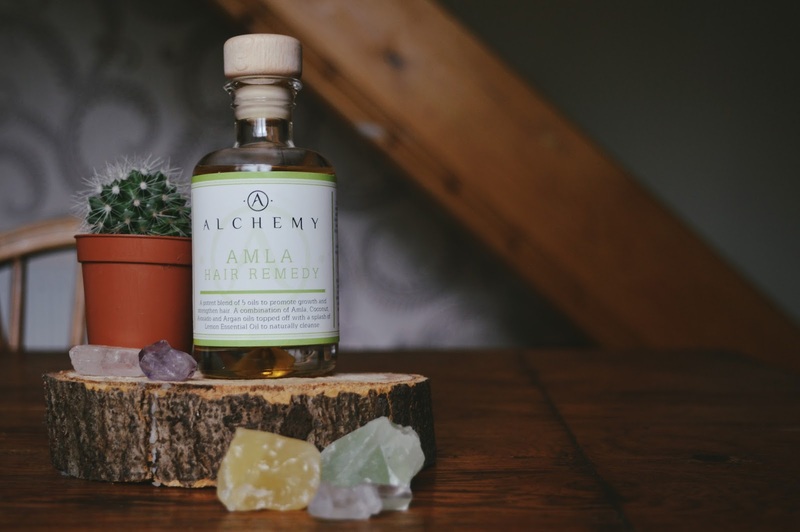 However, when Alchemy Oils* kindly emailed me about trying their Amla Hair Remedy, I was intrigued. They only use natural essential oils and, even better, don’t test on animals and are Vegan Society approved. You won’t find any parabens, PEGS, phthalates, sulphates, silicones and the like hidden within its ingredients list either. This combination sounded like the perfect product to persuade me out of my reluctant ways! With amla, avocado, coconut, argan oils and a dash of lemon essential oil, the Amla Hair Remedy is not only a feast for the senses, but perfect for those seeking a product to strengthen their hair and promote growth. Amla, which is derived from the Indian Gooseberry and contains a number of essential fatty acids, is also known for its hair follicle stimulating and conditioning properties. Nourishing elements aside, I was pretty excited that the Amla Hair Remedy also promised a brilliant shine to my hair. As someone who dyes their hair on regular basis, lets just say my hair could do with a little TLC. So, when I arrived home to a lovely package waiting for me, you can imagine how eager I was to give my new product a try! The first thing I noticed was how beautiful the packaging was. Anything that incorporates a wooden cork topper grabs my attention! I also appreciated how much consideration had gone into the delivery, as it arrived in a small box stuffed with polystyrene cushioning to avoid any unfortunate mishaps. It smells absolutely gorgeous, and the lemon essential oil really packs a punch, so if you find yourself drawn to citrus scents then this is one you’ll love. You can either use the Hair Remedy as a heavenly deep conditioning treatment by massaging it into the roots and leaving it for thirty minutes before washing, or as styling product on damp hair before drying. I’ve found this to be the perfect excuse to cram in some pamper time, as there’s nothing lovelier than massaging the remedy into my hair, tying it up in a bun and grabbing a moment to relax before jumping into a hot shower. *This post is in collaboration with Alchemy Oils and I was kindly sent their Amla Hair Remedy to try. All opinions are my own.